Operation Libya (#OPLIBYA) - Anonymous Press Release for Free citizens of the world ! For a long time the people of Libya have suffered under the madness of their leader, Muammar Abu Minya al-Gaddafi, and his government. For too long, the people of Libya have suffered in silence. With the recent riots in Tunisia and Egypt, the fear is gone by the Arabs throughout the region. It 'not to spend more time in silence. 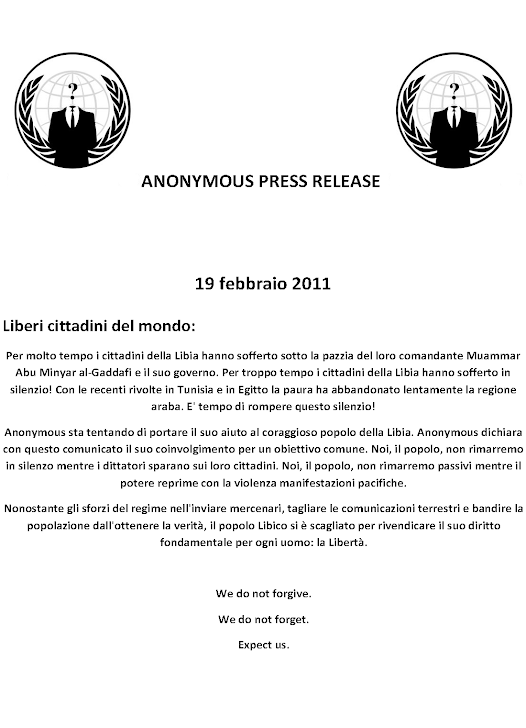 Anonymous is trying to bring its support to the courageous people of Libya. Anonymous says his involvement with this release for a common goal. We, the people will not be silent as dictators shoot their citizens. We, the people will not remain passive while the power to repress peaceful demonstrations with violence. Despite the regime's efforts in sending mercenaries to cut land communications, and ban people from getting the truth, the Libyan people lashed out to claim what is theirs as human beings: freedom.